I started this blog because it seemed to me that the world was ignoring my beloved Catalonia. The only thing that ever appeared in the papers was about Gaudí, pa amb tomàquet, or Barça. Don't get me wrong, those are all lovely things, but Catalonia is much, more more. So, I thought I would translate a few articles here and there to give a more realistic picture of what's going on there. As I write this, in late September, 2012, there are more articles about Catalonia in the paper than I have ever seen. Not only that, they actually mention "Catalonia" and not "a region in northeastern Spain". The change has been remarkable, and swift. Of course, a lot of that is due to the massive march for Catalan Independence on Tuesday, September 11, 2012. And so on the one hand, it might seem less necessary to keep translating articles from the Catalan press. But the more I read the articles in English language papers, too often with Madrid-based correspondents, the more I think it is still necessary for non-Catalan speakers to be able to hear exactly what is being said in Catalonia. And so I am translating as fast as I can. I cannot tell you that I am an independent observer. I'm not sure such a thing exists. Although I am American by birth, with no Catalan ancestors that I know of, I lived in Barcelona between 1987 and 1993, and again for the 2010-11 school year, and I have spent many weeks and months there in all the intervening years. My husband is from there, our children speak Catalan, we are even members of a gang of castellers—a quintessentially Catalan tradition combining craziness and wisdom to forge human towers many levels high. It has never felt to me like Catalonia was part of Spain. That might seem strange if you've never been there. But it's true. There's something about their unique language, their culture, their traditions that sets them apart. The fact that they are also considered by the rest of Spain to be something totally different, often in a negative way, only underscores the issue. I personally believe that most Catalans might have found a way (and might still find a way) to continue within Spain if Spain weren't being so absurdly obtuse about it. Catalonia sends an inordinate amount of tax revenues to Spain, some 16 billion euros annually more than it ever gets back, which amounts to some 9% of its GDP. And what comes back? While Spain builds expensive high speed rail—just to name one tiny example—out to underpopulated areas, the major Mediterranean port cities of València and Barcelona remain unconnected with each other and with Europe. That's bad enough. The insistent disregard for and rejection of the Catalan language and culture is another aggravating factor. But the thing I think will push Catalonia over the edge is the absolute scorn and disgust with which they are treated by way too many Spanish politicians. It's one thing to pay for someone else's lunch, it's quite another to have them spit in your eye, call you stingy, and steal your lunch while you do it. For those, and many more reasons, I believe Catalonia should be allowed to choose its own destiny. So, now you know where I stand. I hope you find the blog useful. Questions and suggestions welcome. I hope it's obvious that I don't do this for money. Still, if I got paid, I'd have more time to do more of it. 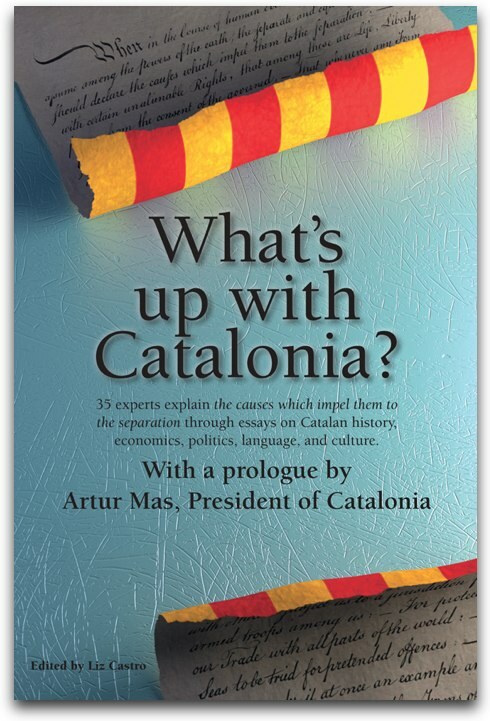 If you want to support me, I invite you to send me money via Paypal, or buy one of the books I've published about Catalonia: What Catalans Want: Could Catalonia be Europe's Next State?, by Toni Strubell with photographs by Lluís Brunet, and Barcelona, Catalonia: A View from the Inside.